Congratulations to the winners - tfanjoy and Diana Mieczan! 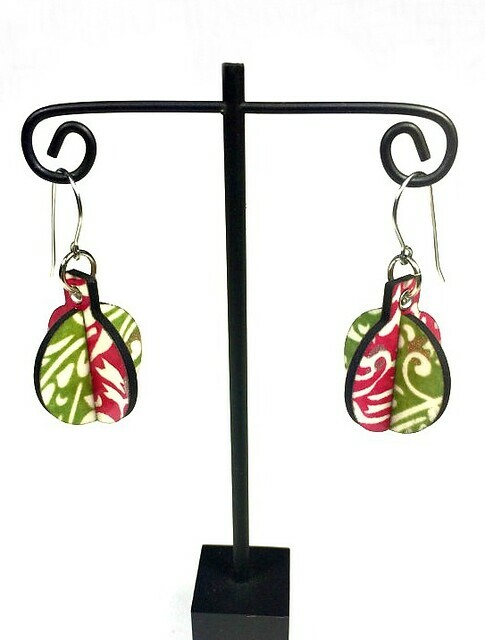 Paper Julep's hand-screened paper and paste paper earrings may have caught your eye when they were featured here a couple of months ago. 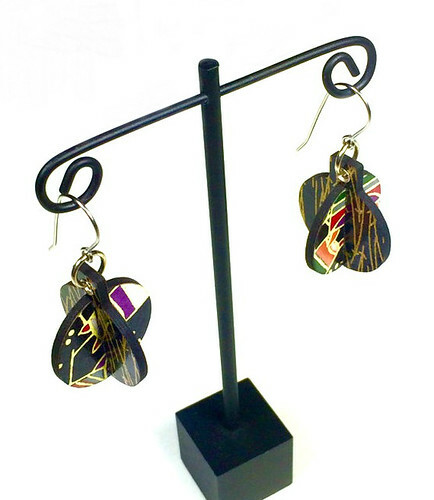 Since then, artist Karen Krieger has been busy with craft shows around the country, but recently found time to add an assortment of colorful earrings to her Etsy shop where she also sells creative metalwork. 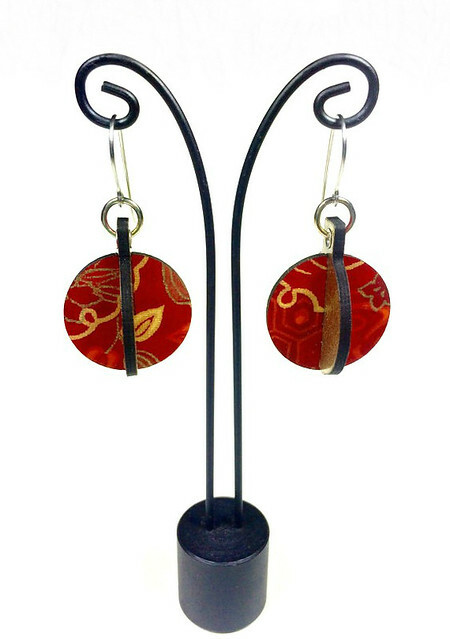 Paper Julep dimensional earrings are made with Japanese yuzen or chiyogami papers and Karen's hand-painted paste papers. Each pair features contrasting or complimentary colors. The papers are laminated to archival museum board, laser cut, and sealed with acrylic lacquer. 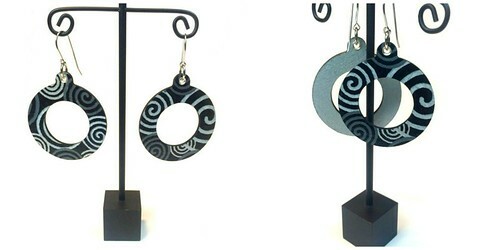 The earrings are very comfortable to wear and swing lightly as you move. Surgical steel ear wires and rubber nuts keep them safely in place. Earrings will arrive packaged in a gift box/bag with care information and artist bio. What a nice present for yourself or someone on your list! 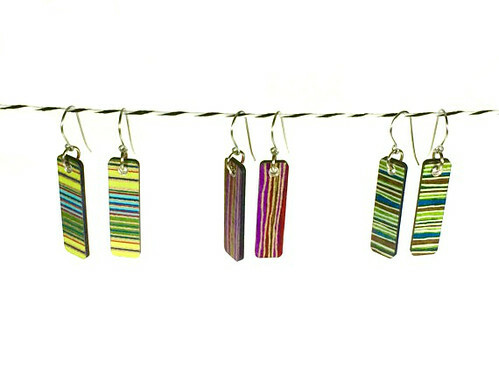 Now about the giveaway... two U.S. residents will each win a pair of earrings of their choice from the shop. Just leave a comment below as your entry through Sunday, December 14, 2014. Include an email address within your comment as Blogger doesn't allow me to see the top portion of the form. The winners will be selected at random and announced at the top of this post as soon as they have been contacted. Good luck! Wow, that's paper? The drill bit dangles are wonderful. LOVE, LOVE, LOVE these beauties! Amazing! These are so beautiful and fun! Very creative. I specially appreciate the hand painted papers. Unique! So so pretty! I'd love to win a pair! Swoon, all those earrings are so beautiful:) Have a great day, lovely. Very pretty and very clever thanks for the chance to win. What a fabulous way to use paper! I would love to get some for my daughter! She would love them! 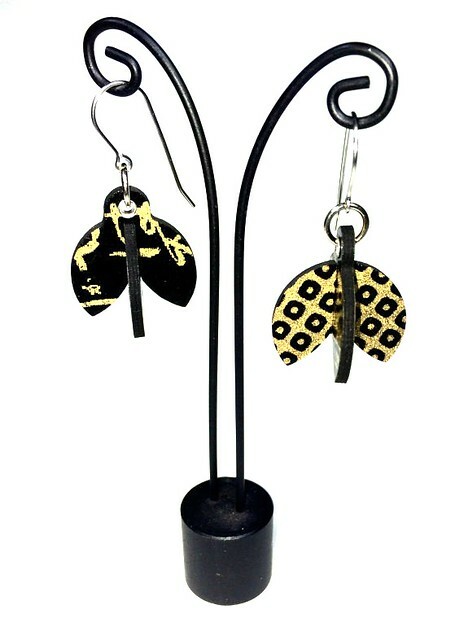 I especially love the earrings made with those origami paper-like designs. Gorgeous! You would never find these one of a kind earrings in any store. So unique!! It's amazing that these are made of paper. I love these designs - so stylish and unique! I would really love a pair of these earrings. These are beautiful! They would be a great gift for my daughter! Left a comment, not sure it went through. Thank you for introducing a new (to me) artist and for a chance to win! These are beautiful! Thanks for the giveaway!